QWOP games are games that require a lot of focus and coordination, even more in the case of Surgeon Simulator 2013, a free PC game where you have to perform a heart transplant. The task has as much of surreal as of funny, since things will quickly turn into chaos. You have a lot of tools at your disposal as well as the new heart, but it won’t be easy to go through the ribcage and remove the heart. Should you use the saw or the hammer? Or should you pick up any other of the remaining tools that are most likely scattered across the tables, since you’ve managed to make a mess out of your operating room? Whatever it is, the patient will surely see his body filled with lots of trash and tools, but in the end the important thing is that the heart is replaced. Not the most clean of surgeries, but it will do the job. You’ve probably guessed by now, Surgeon Simulator 2013 is just some crazy fun and not a simulator at all. You’ll laugh as the hand you control seems to have a life of its own and you’ll punch the air the first time you complete the surgery. 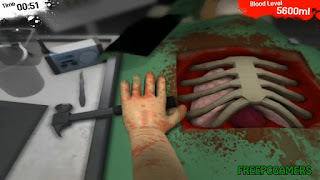 Enjoy this crazy game and hope that you never come across a surgeon such as yourself in real life.